Two bedrooms, 1.5 baths, two story with reserved parking. The home is located less than 2 miles from Mt. Tabor Park. Less than 10 miles from Downtown Portland and easy access to public transportation. Less than 10 miles from the airport and close to major freeways (205/84). The home is tranquil, quiet, clean and comfortable. This is a two bedroom 1.5 bath home with an additional full sized pull out couch. In my twenties, I was a flight attendant and developed a love for travel. It brings me great joy to meet folks from all over the world and all over the US. Since leaving the airlines I have worked as a caseworker for children who have been abused, neglected and abandoned. It is my life's mission to fix systemic issues to ensure a healthy and safe community. It is quiet and private, the building sits off the main roadway. It is exactly as seen in the pictures. I have remodeled this home and furnished it with items I found to be most comfortable and lovely. My hope is to rent it to folks who are considerate and show as much respect for my property as one does their own home. The rental is for up to six people. The townhouse is just south of Mt Tabor. It is 5.5 miles from downtown. And 8.9 miles from the Airport. It's a lovely, two-story space. A recently remodeled kitchen. Washer and dryer for convenience. Reserved parking spot. Excellent WiFi. There is a smart TV in the living room. The TV allows you to enter your HBO, Netflix, HULU, etc. account numbers. There is also an HDMI extension to use with your laptop for Amazon Prime, DirectTV, or Comcast programming. It is fully equipped with sheets, towels, dishware, cookware, iron, ironing table, hair dryer, etc. Also, for your convenience, there is a 24-hour check-in. Check-in is at 3 pm or later. toilet, combination tub/shower, tub, On the second floor. Netflix, and Amazon Prime available. Some books on Book shelf. Very clean unit. Everything you need. Luisa very kind, checked in to see if everything okay and if we needed anything. Great bed! Perfectly acceptable place. The air conditioning unit is inside and very loud, but kept it cool. Nice suburban area that felt safe. The property manager was very helpful. Four stars only because it’s definitely a budget option, but a good budget option I would consider staying in again. This property was clean and comfortable. Everything worked fine: the shower, the bedroom air conditioner, the TV and WI-FI. The bathroom towels were nice and the bed was comfortable. It was quiet; we were there six nights and didn't hear any noise from the neighbors. It isn't in the most interesting neighborhood in Portland - not much to walk to - but there are grocery stores a very short drive away and the neighborhoods that offer more are about a 10-15 minute drive away. Luisa was very responsive, offering to bring anything we might need, and we enjoyed the restaurant she recommended for dinner. it was just what we needed and we were able to have our cat. true to pictures and having the washer/dryer was great. so why 4 stars?.....it would have been more comfortable with better indoor and outdoor seating. but again, as shown in pictures. The apartment was very clean and had everything you would need. Luisa met us at time of arrival. Couldn’t have ask for a nicer landlord. She checked in to make sure very thing was going well through out the stay. Close to everything . A great place to stay in Portland. The place was freezing the entire time we were there and could not get the heat to turn up downstairs! This made our stay pretty unenjoyable because we had to wear our coats anytime we were were downstairs. The upstairs bedroom heater seemed to work fine but there was no TV in the room. The TV had no cable so getting just the local channels was a challenge with the entenna and no DVD to even rent and watch a movie with. There was no couch downstairs only two sitting chairs. The cleaner was still there when we arrived and had all the towels and sheets in the dryer still wet. I had an early morning 4 hour trip to get there so when we arrived at 2 for check in we were looking forward to a quick nap before the evening but couldn't do that until we finished drying the sheets and making the bed! The owner was made aware of this and did refund us the cleaning fee. Just some smalls things that would have made the stay better were simple attention to details lacked. We were given one handtowel for a two bathroom unit, there was a full kitchen but no oven sheets for the oven so we could not use the oven like we needed to. There was a smelly kitchen spounge in the sink so we were relunctant to even eat off the dishes for fear that they had been cleaned with it. I picked this place because the price seemed reasonable for what you got but the old saying "you get what you pay for" ........I will pay more next time to stay in a nicer place for sure with appropriate heat. I did read a review about this place being cold with the hardwood floor and to bring slippers, boy they weren't kidding! You arrived early, my cleaning lady was still there. You asked her to leave before she was able to finish her work. Which includes turning on some lights and the heaters, replenishing supplies, and ensuring everything is back to order. She made a big mistake in that she forgot to bring the extra set of sheets and towels that are part of the revolving set of linens she works with. According to her they were almost done drying and she was about to finish but you asked her to leave, before your check in-time. For years she has always done an excellent job cleaning, washing laundry, resupplying, and being timely. I apologized and explained to you, her husband was just hospitalized, she has three small children and she isnt herself. I refunded the cleaning fee because of this. I also asked you to let me know if any supplies were missing or anything else amiss and I would gladly resolve it. You did not tell me the heat was off downstairs, I would've been more than happy to tell you how to turn it on or come do it myself. My listing states there is no cable TV. 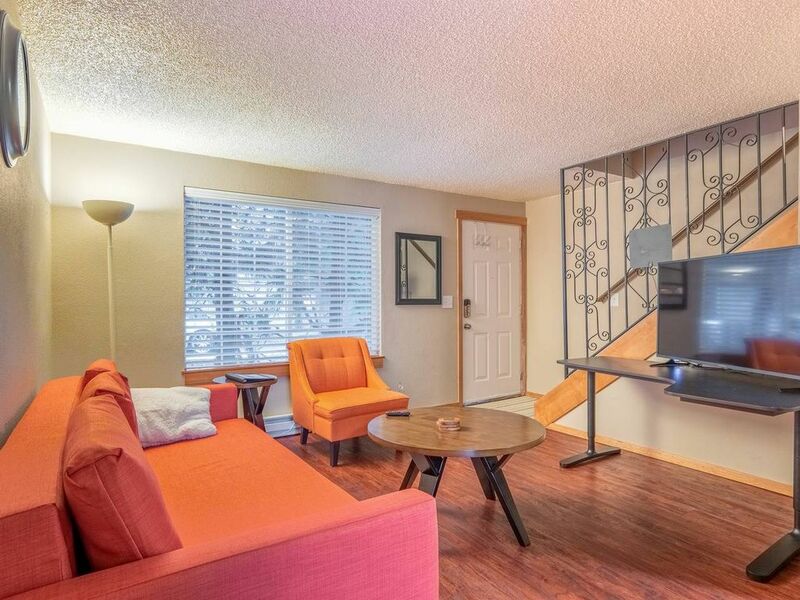 The pictures of my listing show there are two orange chairs, no couch in the living room. There were new sponges under the sink. There was dishwashing liquid on the countertop. I just checked. I think aside from you checking in early and Sonia not bringing the linens. The biggest error was lack of communication on all sides. Since this is my home it is ultimately my responsibility, I will try to find a way to resolve this. Gambling Casinos in Washington State 20 minutes. White water rafting in the Deshutes River. Skiing and snowboarding at Mt Hood.